Our camping pods are a unique single room structure based on and inspired by the historic cruck frame. This design gives the building an elegant curve reminiscent of an upturned boat. The frame is hand jointed and pegged using traditional carpentry techniques. We construct the camping pod from locally sourced timber and use eco insulation combined with an electrical hookup and double glazing. 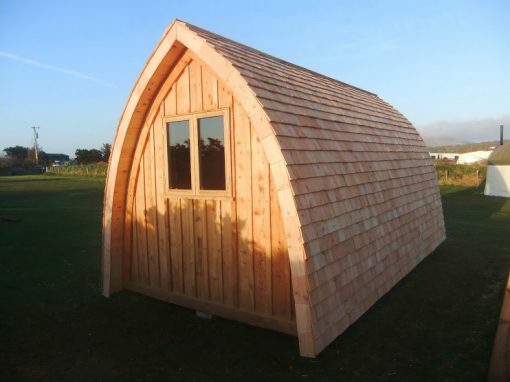 This gives an ideal basis for a garden building or for sleeping units for a glamping business. You can fully specify how our camping pods are finished. Each pod is unique and can be finished externally and internally with a range of options. We can also fit them with a chassis with wheels for easy movement around your property.